Do they off-gas in an Earthship?? I hear questions like these all the time and it's time to clarify some little known facts about the EVIL DANGEROUS TERRIBLE car tyre! Rubber, sulfur and carbon black. 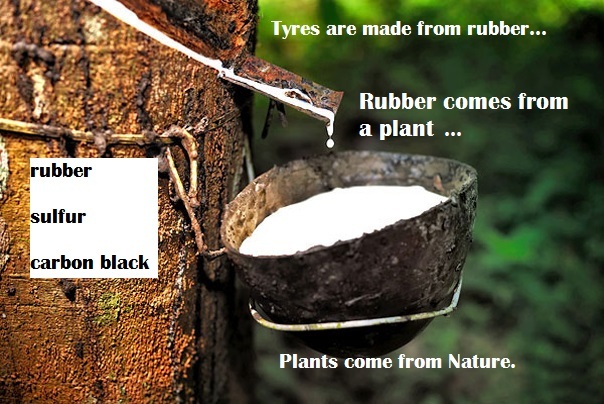 Rubber, as we know, comes from a plant (no harm there); Sulfur is also a naturally occurring substance, which leaves carbon black: carbon black is a petroleum based product and is widely used as a colourant in things like kitchen utensils and cake tins so it shouldn't be dangerous for our health. Synthetic tyres are made from silicone, another product widely used in the food industry. So what are tyres off-gassing and why is everyone so worried about it? The average passenger tyre lasts anywhere from one year or longer and as the tyre turns and is in contact with the road surface, tiny particles of the tyre are worn off, this is known as road dust and if you have ever lived in a city or on a busy road you will know what I am talking about. 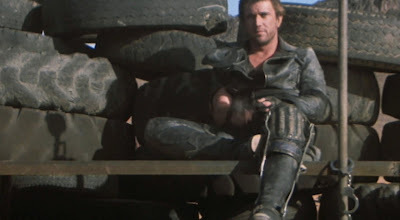 In the tyre's life any so called off-gassing would certainly have taken place under the conditions it is used in, IE: rolling along a hot hard surface at speed. By the time the tyre finds itself in landfill or (my back wall) it is pretty harmless and anyway as a part of my back wall it is buried on one side by two plus tonnes of dirt and rendered on the other, so off-gassing is not even a consideration, I could go on about formaldehyde, carpets and other chemical cocktails we are surrounded by in a contemporary house but I won't. Fire is not an issue either once the tyres are compacted to 90% with rammed earth, it's like the yellow pages, you can easily burn a page or two but if you try and burn the whole book it won't. 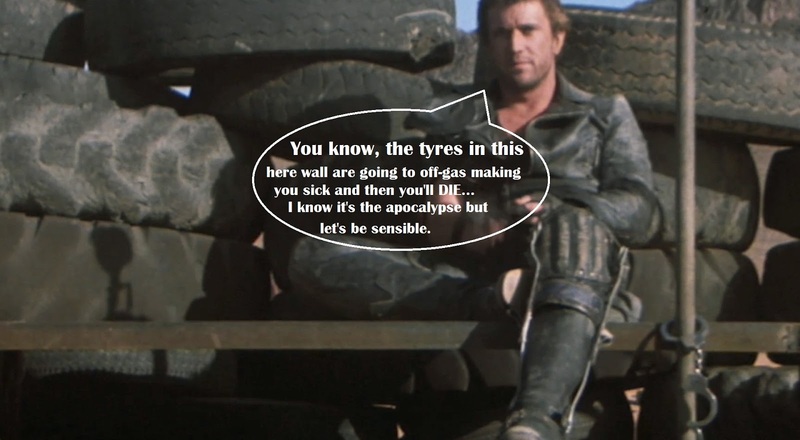 I love car tyres as a building material. 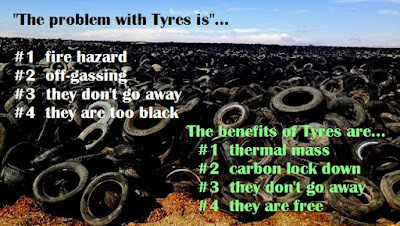 I hope this information has been useful and that you can see a different side to this misunderstood resource, remember 52.5 million passenger car tyres every year in Australia alone, compounding every year, with figures like that it can't be anything but a resource can it?